Sonoma State University will again be offering my “Beer Appreciation” certificate course this fall. Classes start in just over two weeks, on September 9. The class is through SSU’s Extended Education school, and fueled by Lagunitas, which is where the 12-week, 36-hour course will be held. Classes are once a week, beginning September 9, on Wednesday nights from 6:30-9:30, and again classes won’t be in a stuffy classroom, but will be held in special lounge room at Lagunitas Brewing in Petaluma. If you’re interested in learning more about the class, I set up a page with more about my Sonoma State University Beer Appreciation Course. Or if you’re ready to go, here’s the official SSU class page and there’s information online about registration, too. 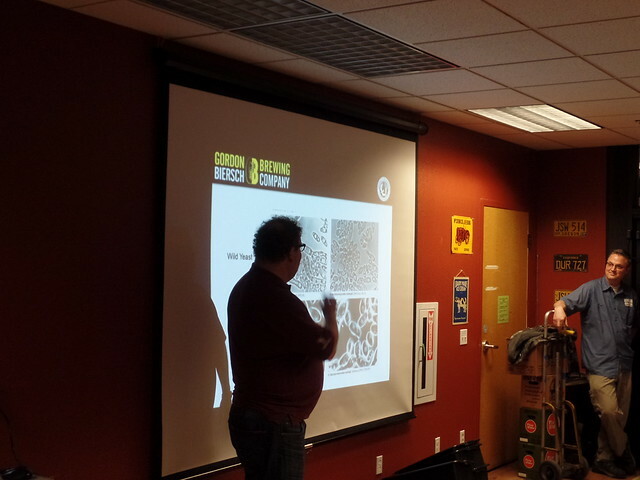 A scene from last semester’s class, with Dan Gordon talking about lagers, while Vinnie Cilurzo waits in the wings to present to the class about sour and barrel-aged beers.